Cow! Hello Cow! Hello, moo, Moo MOO! Did you know that Vermont has more cows than people!? Ok, so that’s not actually true, (although per capita, Vermont does have the largest ratio of cows to people in the country!) But regardless, cows are a very important and iconic part of Vermont. They are an integral part of our economy, our landscape and especially our cheese and ice cream addiction! They have also served as inspiration for countless artists. So what Vermont festival would be complete without an adorable jersey calf? 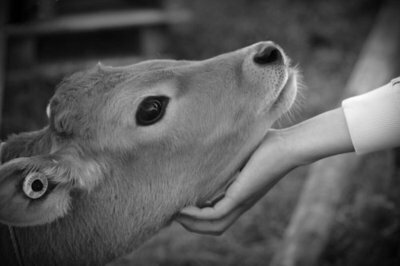 Well it just so happens that the Stowe Street Arts Festival will be joined by the beautiful 2 mo old Jersey calf, Brittney (or one of her friends)! On Saturday around 1pm Brittney will take a break from the fields of the organic Wallace Farm and to join us in her pen off of Bidwell Lane. Bring the kids and your camera! The kids can pet Brittney and have their photo taken with her and maybe even learn a little about farming too!